Suspense's "Three Blind Mice" stars Van Heflin in a radio noir about a publishing firm and its three partners. One is dead, the other is on Death Row, and the third has taken over the firm from the other two. The episode opens inside the office of Lockwood, Bentley and Walsh Publishing. Mr. Arthur Lockwood knows that his partners are out to get him, and it appears that everyone in the company knows as well. By all appearances, he is on the way down. Mr. Lockwood refuses to accept that. He wants his corporation back from his partners. He also wants Helen Conover, the head of the firm's promotion department, but she is involved with his partner, Mr. Walsh. None of this worries Mr. Lockwood. He seems confident that there will be a day when he is back on top. When Mr. Lockwood finds one of his partners dead at the office, it appears that his problems may be resolved sooner than he thought. "Three Blind Mice" was written by Kenneth Pettis and Robert L. Richards. 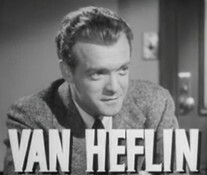 Van Heflin starred as Arthur Lockwood. Also appearing were Cathy Lewis, William Johnstone, and Wally Maher. This episode aired on January 30, 1947.